Keep your DEWALT 20V MAX Tool running longer with a premium 5.0 Amp hour Lithium-Ion battery pack. This pack is compatible with entire line of 20V MAX tools. Achieves maximum productivity and less downtime with no memory and virtually no self-discharge. The DEWALT 350-Lumen Flashlight keeps jobsites lit with technology that can run for up to 5 hours at a time. Use the focus feature to adjust beam distance up to 10 times. This durable flashlight survives a repeated 6.6-foot drop test and is IP54-rated dust and water resistant. AAA batteries are included with this powerful light. This 18V Lithium-Ion Battery Platform from Makita offers extended runtime and more cycles over the life of the battery versus NiCad and Ni-MH batteries. Its Optimum Charging System utilizes three active controls (Current, Voltage and Temperature) to maximize battery life, while the Built-In Memory Chip communicates with the charger CPU to optimize the charging process based on the unique conditions of each battery. 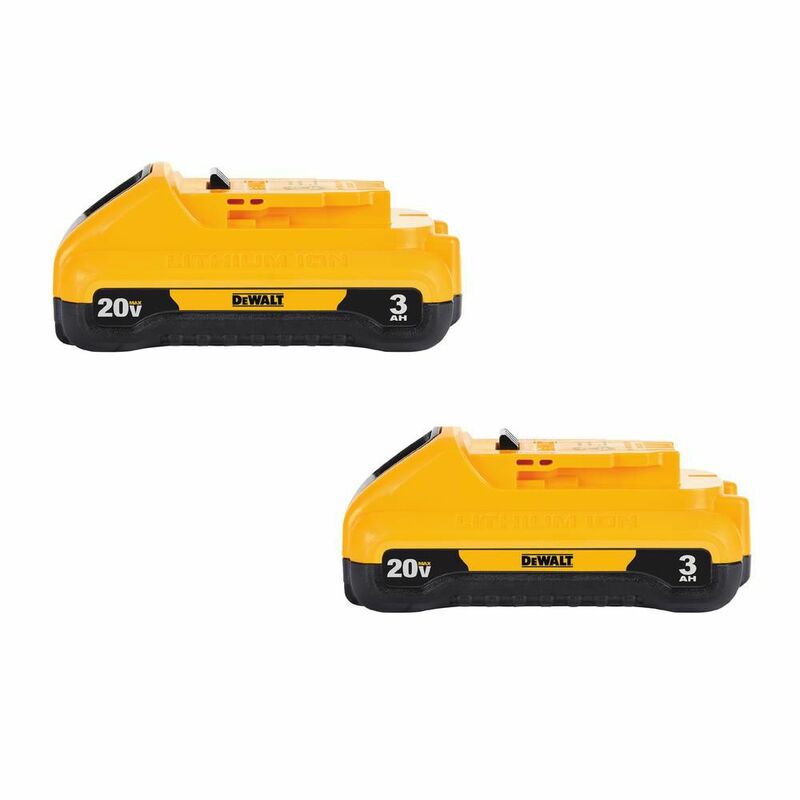 20V MAX 3 Ah Lithium-Ion Compact Battery (2-Pack) This 20V MAX* 3 Ah Battery 2-Pack gives you a pair of our highest-capacity batteries in the 20V MAX* compact series. They provide 3 Ah capacity with reduced weight, giving you ergonomic benefits for extended power tool use. It includes a 3-LED Fuel Gauge system to instantly check battery state of charge. This battery is compatible with all DEWALT 20V MAX* power tools and includes 3-Year Limited Warranty. 20V MAX 3 Ah Lithium-Ion Compact Battery (2-Pack) is rated 4.3 out of 5 by 95. Rated 5 out of 5 by DonebyDave from Perfect !!... Perfect !! Rated 5 out of 5 by quiltinman from fits perfectly has lasting use. fits perfectly has lasting use. Rated 5 out of 5 by HomeDepotCustomer from Easy quick charge. DeWalt for the Win!... Easy quick charge. DeWalt for the Win!